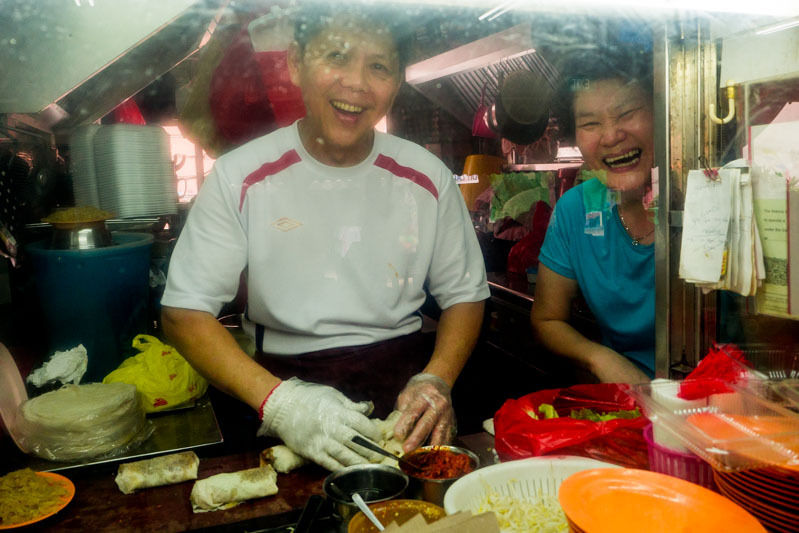 Popiah stalls are aplenty in Singapore, but ones that sell Popiah Sushi are either few and far between, or don’t exist at all. When I chanced upon this stall in my neighbourhood, I stopped in my tracks and tried to put two and two together. How did these dishes that are worlds apart, end up as a hybrid of two of my go-to comfort foods? I knew I couldn’t pass up on trying it. 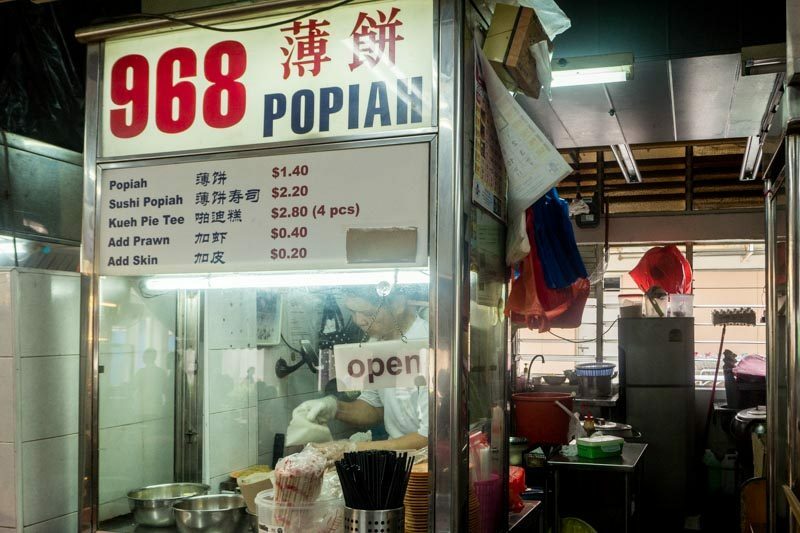 968 Popiah in Whampoa is where you’ll find this popiah with a twist. With a signboard proudly proclaiming the existence of this dish that is uniquely theirs, it’ll be hard to miss it. 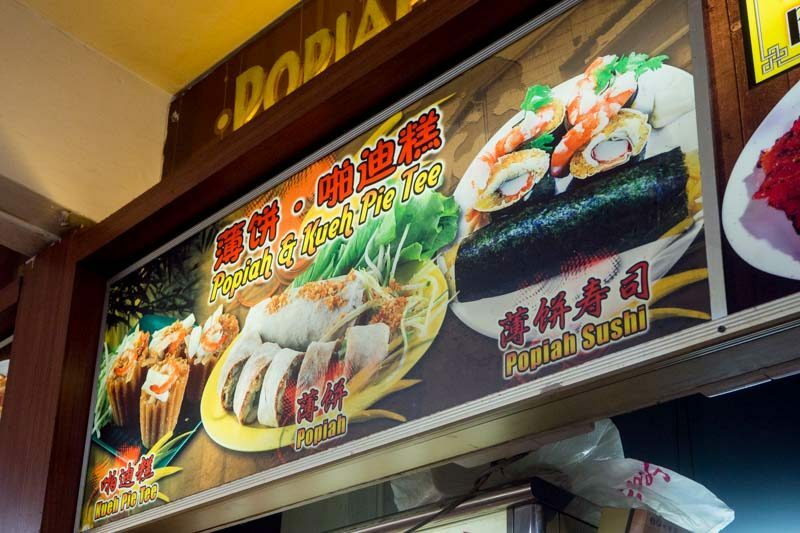 A quick word with the friendly owners and I found out that the Popiah Sushi ($2.20) was birthed from a simple request by their customers for a cold dish to be included on the menu. Still clueless as to how sushi came to mind, I was nonetheless eager to find out what it tastes like and ordered a roll without hesitation. 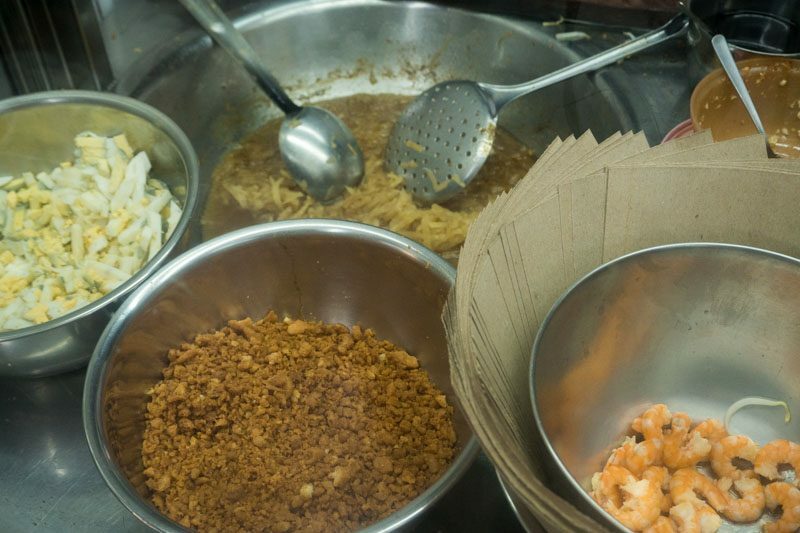 The sushi popiah is made up of the usual suspects of cooked turnip, hard-boiled eggs, and prawns; all the essential ingredients of a fat, juicy popiah. Just looking at the ingredients alone, I was already starting to feel my tummy rumble in hunger. 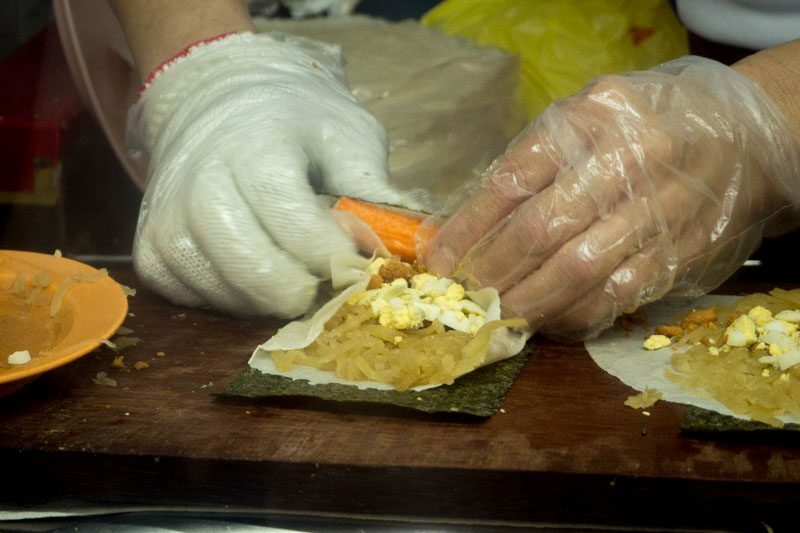 Before piling the ingredients onto the popiah skin, the owner laid a sheet of nori under it to emulate a maki sushi. And unlike regular popiah, you won’t be asked if you want chilli at this juncture. 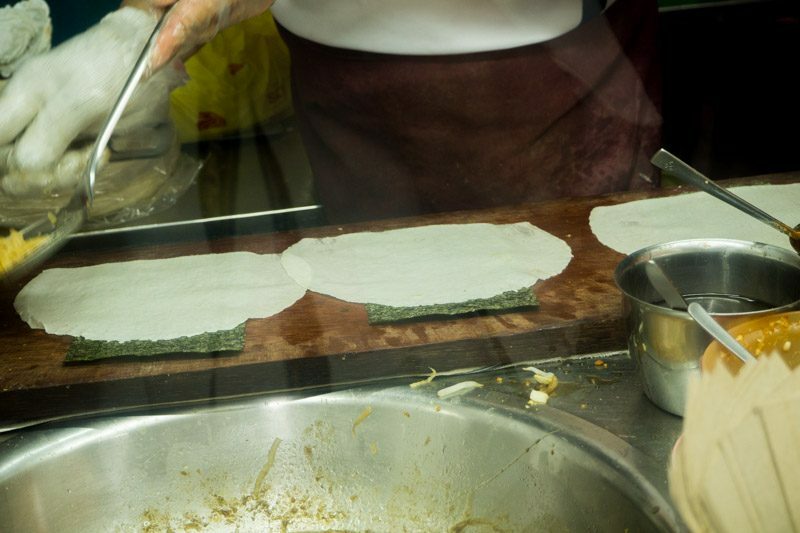 The seaweed was an oddly, good addition to the classic dish, which gave the popiah extra flavour and crunch. 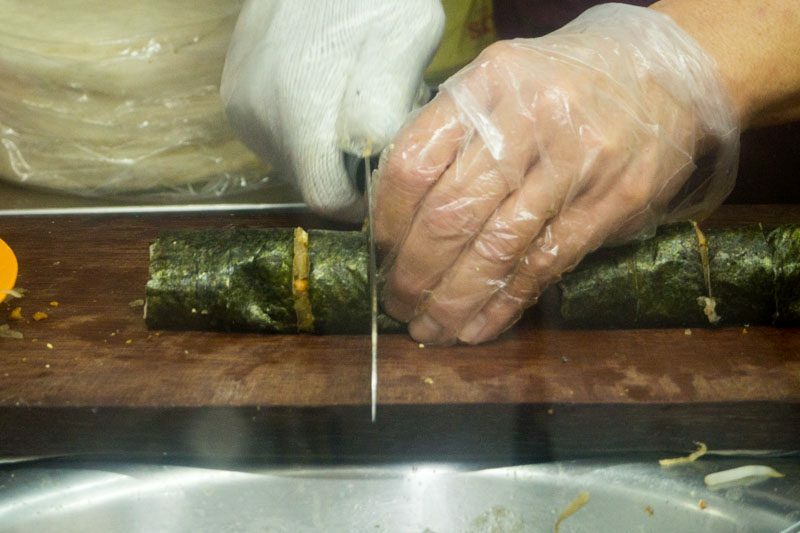 I might even consider suggesting adding nori flakes as a topping for the regular popiah when my family prepares it in future. After layering the usual ingredients, an entire crabmeat stick is then rolled in, justifying its cost as compared to the other items on the menu. Once tightly wrapped, the rolls are sliced into pieces, waiting to be garnished and plated. If you’re wondering whether it’s more popular than the regular popiahs, let’s just say that these pictures were of orders from an uncle before me, who seemed to be a regular customer chatting to the owners like an old friend. After the roll was plated, mayonnaise was dispensed from a squeeze bottle. It was at this step that I was asked if I wanted chilli to go with. The chilli was homemade, spotting bits of roughly chopped fresh garlic for an added kick to the otherwise sweet base. This will go easy on those who can’t take spicy food, so boldly ask for more if you’d like a stronger flavour. 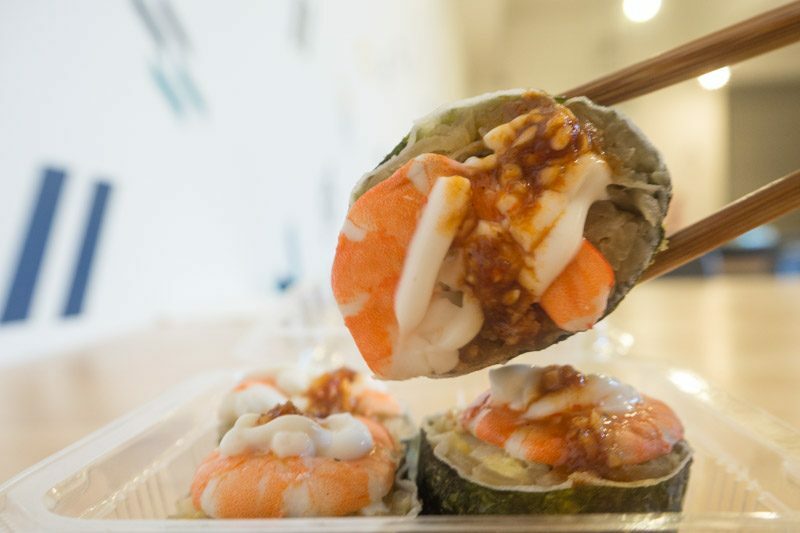 Admittedly, I was on the fence when I saw this dish; how could any other food form taste like sushi, and alternatively, would it spoil the taste of our local dish? All my questions were soon put to rest when I took a bite of the Popiah Sushi. It was almost like a ‘healthier‘ version — when I say healthier, I’m using the term loosely, of course — of sushi; replacing rice with cooked turnips was a pretty good idea for those who want to cut down on carbs. 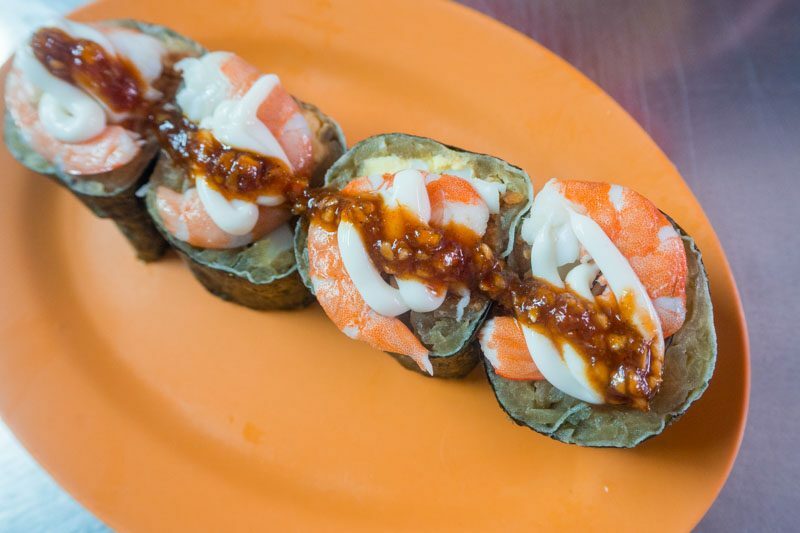 You may want to order more if you’re sharing it as a side, as each roll will only give you about four pieces of Popiah Sushi. I would definitely buy a roll or two when I walk past the stall again. 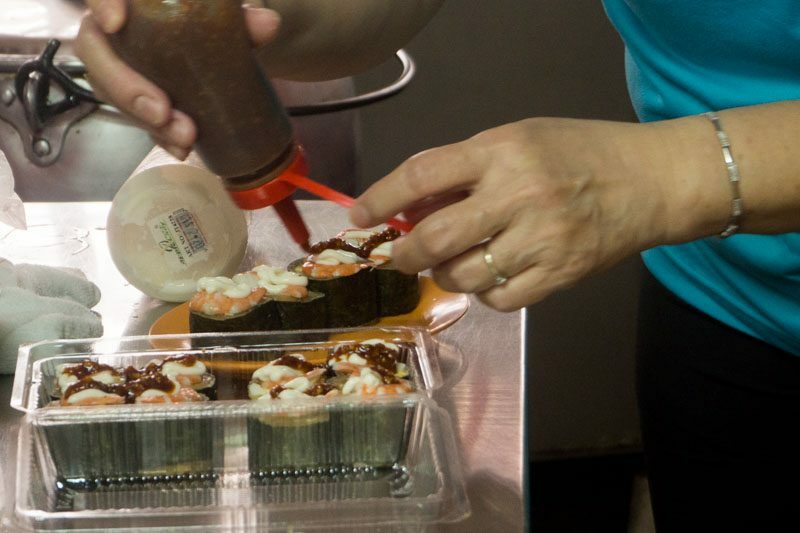 And to make the experience slightly more authentic, I may even suggest that the stall owners swap the regular mayonnaise for wasabi mayo instead, or prepare a dollop of wasabi and soy sauce at the side for dipping.